Once again on Saturday at Dover International Speedway in the NASCAR Sprint Cup Series (NSCS), it was Sunday’s pole-sitter, Denny Hamlin – with a lap speed of 156.087 MPH – showing the quickest way around the track during the final FedEx 400 benefiting Autism Speaks practice session. Carl Edwards also showed consistency as he was second quickest in the session with a lap speed of 155.602 MPH, and he was followed by Paul Menard (155.206 MPH) who was third, Matt Kenseth (154.979) fourth and Kyle Busch (154.706) was fifth. Rounding out the top-10 quickest drivers in the “Happy Hour” (final) practice were Jimmie Johnson (154.639 MPH) who was sixth, Kevin Harvick (154.599) seventh, Jamie McMurray (154.110) eighth, Jeff Gordon (154.096) ninth and Kurt Busch (153.978) posting the 10th quickest lap speed. The 46th annual FedEx 400 benefiting Autism Speaks is scheduled to get started around 1:20 p.m. (ET) Sunday afternoon, and FOX Sports 1 will provide television coverage of the race. Two in a row! Jimmie Johnson wins for the second race in a row with today’s victory at Monster Mile. After a 4-lap dash to the finish, it was last week’s NASCAR Sprint Cup Series (NSCS) Coca-Cola 600 winner, Jimmie Johnson, going to victory lane in Sunday’s NSCS FedEx 400 at Dover International Speedway. Following Johnson to the drop of the checkered flag by 0.885 seconds to finish second was pole-sitter, Brad Keselowski, and they were followed by the new series points leader, Matt Kenseth finishing third, Clint Bowyer fourth and Denny Hamlin finished fifth. Rounding out the top-ten finishing positions were Martin Truex, Jr., claiming sixth-place, Tony Stewart seventh, Joey Logano eighth, Dale Earnhardt, Jr. ninth and Paul Menard brining home tenth. With Matt Kenseth’s third-place finish, he leaves Dover with a 2-point lead over Jeff Gordon, who finished fifteenth. Time of Race: 3 Hrs, 23 Mins, 52 Secs. Next Up: The Pocono 400 on Sunday, June 8th, with an approximate starting time of 1:20 p.m. (ET) and television coverage provided by TNT beginning with their 12:00 p.m. (ET) Countdown to Green pre-race show. Drivers outside the Top 16 with a win. Last week’s NASCAR Sprint Cup Series (NSCS) Coca-Cola 600 winner, Jimmie Johnson, put up the fastest lap in Saturday’s final FedEx 400 practice session at Dover International Speedway – showing a speed of 158.863 m.p.h, at the top of the speed chart. Tomorrow’s pole-sitter, Brad Keseloski, was second fastest with a lap speed of 158.270 m.p.h., and he was followed by Ryan Newman (158.263 m.p.h.) who was third, Denny Hamlin (158.193) fourth and Kevin Harvick (157.798) was fifth fastest. Rounding out the top-ten fastest drivers in the “Happy Hour” (final) practice were A.J. Allmendinger (157.398 m.p.h.) who was sixth, Carl Edwards (157.356) seventh, Brian Vickers (157.350) eighth, Paul Menard (157.212) ninth and series Sunoco Rookie of the Year (ROTY) candidate, Kyle Larson (157.150) posting tenth. 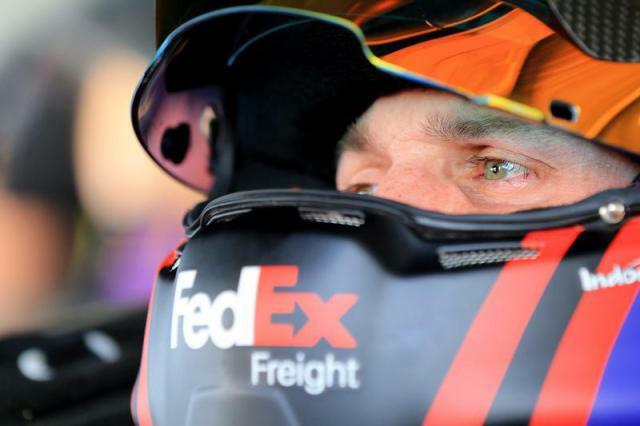 The 45th annual FedEx 400 is scheduled to get started around 1:20 p.m. (ET) Sunday afternoon, and FOX will conclude their season coverage (TNT takes over for the next six races starting with Pocono) with their 12:30 p.m. (ET) pre-race show. Sunday’s NASCAR Sprint Cup Series (NSCS) pole-sitter, Brad Keselowski, with a lap speed of 159.702 m.p.h., was the quickest Saturday morning during the second FedEx 400 practice session at Dover International Speedway. Kevin Harvick, with a lap speed of 159.341 m.p.h., put up the second quickest lap speed, and was followed by Carl Edwards (158.856 m.p.h.) who was third, Brian Vickers (158.716) fourth and Matt Kenseth (158.513) was fifth. Rounding out the top-ten quickest drivers in the session were Dale Earnhardt, Jr. (158.416 m.p.h.) who was sixth, Clint Bowyer (158.339) seventh, Marcos Ambrose (158.304) eighth, Jimmie Johnson (158.242) ninth and Tony Stewart (157.971) posting tenth. “Happy Hour” (final) practice will take place this afternoon from 12:30 p.m. – 1:20 p.m. (ET). On Friday at Dover International Speedway, Brad Keselowski, with a new NASCAR Sprint Cup Series (NSCS) qualifying track record speed of 164.444 m.p.h., captured the 2014 FedEx 400 Coors Light Pole Award. Starting second and on the outside pole with a qualifying lap speed of 163.785 m.p.h., will be Kyle Busch, followed by Joey Logano (163.688 m.p.h.) starting third, Jimmie Johnson (163.362) fourth and series Sunoco Rookie of the Year (ROTY) candidate, Kyle Larson (163.080) starts fifth. Rounding out the top-ten starting positions will be Denny Hamlin (163.066 m.p.h.) starting sixth, Jeff Gordon (163.066) seventh, Kevin Harvick (162.499) eighth, Brian Vickers (162.411) ninth and Clint Bowyer (162.243) will start from tenth. With only 43 drivers attempting to fill the 43-car field, there was no one failing to make the starting lineup. On Saturday, the teams return for two more practice sessions beginning with a morning session from 9:30 a.m. – 10:20 a.m. (ET) and then their “Happy Hour” (final) practice from 12:30 p.m. – 1:20 p.m. (ET). Kyle Busch, with a lap speed of 166.297 m.p.h., was the quickest Friday afternoon during the first NASCAR Sprint Cup Series (NSCS) FedEx 400 practice session at Dover International Speedway. Putting up the second quickest lap speed of 165.609 m.p.h., was Tony Stewart, followed by series Sunoco Rooike of the Year (ROTY) contender, Kyle Larson (165.183 m.p.h.) who was third quickest, Ryan Newman (165.130) fourth and Brad Keselowski (164.888) was fifth. Rounding out the top-ten quickest drivers in the session were Carl Edwards (164.752 m.p.h.) who was sixth, Jeff Gordon (164.714) seventh, ROTY contender Austin Dillon (164.692) eighth, Denny Hamlin (164.669) and Marcos Ambrose (164.594) was tenth quickest. The teams will return later this afternoon at 3:40 p.m. (ET) for qualifying to determine the starting lineup for Sunday afternoon’s race. On Saturday, the teams will have two more practice sessions beginning with a morning session from 9:30 a.m. – 10:20 a.m. (ET) and then their “Happy Hour” (final) practice from 12:30 p.m. – 1:20 p.m. (ET).